Ludwig Mies van der Rohe (1886-1969) undoubtedly is one of the most significant and influential architects ever. His designs and realized buildings, as well as his thinking and writings, until the present day continue to initiate many controversial debates on achievement and failure in modern architecture. Yet not only architects and urban designers have been inspired or appalled by Mies van der Rohe. This new book demonstrates that his influence reaches far beyond the boundaries of the professional architecture world. Almost Nothing collects work by one-hundred painters, sculptors, photographers, film directors, designers, cartoonists, and architects that comment on or appropriate buildings, designs, and statements by or images of the legendary architect. The works also form a hundredfold re-interpretation of Mies van der Rohe’s life and oeuvre. 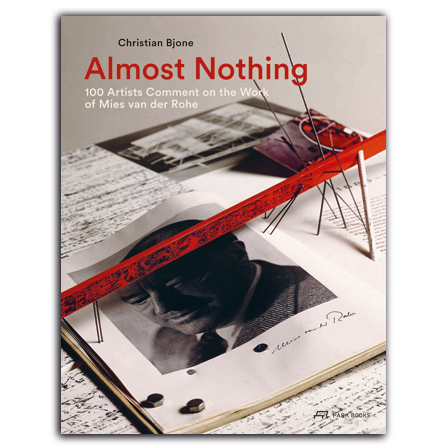 New York-based architect and writer Christian Bjone in his complementing text provides rich background information on the individual artists and the depicted art works. The books’ title refers to a statement by Mies van der Rohe himself on one of his celebrated masterpieces, Crown Hall on IIT campus in Chicago, which combines ingeniously simplicity with complexity. graduated in architecture from University of Illinois at Chicago and Princeton University. Living and working in New York, he is the author of a number of books on architectural history.